Former US navy analyst Jonathan Pollard, jailed for life in 1987 for passing classified information to Israel, has been released. The 61-year-old was freed on Friday morning, ending one of the longest-running and most contentious issues between the US and Israel. Mr Pollard's parole conditions require him to remain in the US for five years. Repeated Israeli appeals over the years for the US to show clemency towards Mr Pollard were rejected. Mr Pollard travelled to a federal courthouse in New York on Friday to challenge the conditions of his parole. Mr Pollard must wear a GPS ankle bracelet and submit to inspections of his home and work. His legal team calls the terms "onerous and oppressive'". Israeli Prime Minister Benjamin Netanyahu said the Israeli people welcomed his release. "As someone who has raised Jonathan Pollard's case for many years with US presidents, I have wished for this day. 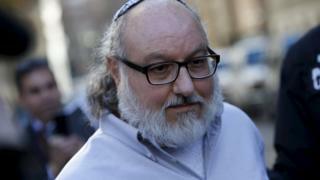 "After 30 long and hard years, Jonathan Pollard is finally reuniting with his family," Mr Netanyahu's spokesperson tweeted. In Israel, Jonathan Pollard has many supporters who joyfully welcome his release. He's widely perceived as having been harshly punished for providing information critical to national security. The Pollard saga has been a long-time strain on relations with Israel's closest ally and there is relief that it is over. However, the cabinet was instructed not to talk about the ex-spy too soon for fear of upsetting Washington. Jonathan Pollard passed secret information to Israel for a year in return for payments until his arrest in 1985. He said he had been frustrated by the US withholding key intelligence from its staunch ally. After he was questioned by the FBI, Mr Pollard and his then-wife, Anne, sought asylum at the Israeli embassy in Washington but were turned away. Israel initially denied Mr Pollard had spied for them, insisting he had worked with "rogue" officials. But in 1995, Israel granted him citizenship, and two years later, they admitted he was their agent. Supporters of Mr Pollard in Israel and the US campaigned for his release, arguing that his sentence was unjust. The US reportedly considered freeing him in 2014 in return for Israeli concessions to the Palestinians during faltering peace talks, before negotiations collapsed. In an interview with the Associated Press in 1998, Mr Pollard said the price he had paid for spying had not been worth it.